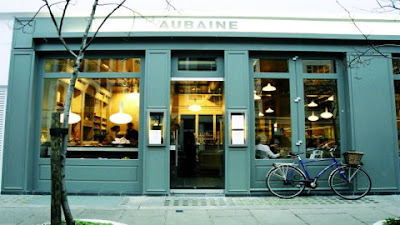 One of my favorite eating places is Aubaine in Chelsea. It is situated a few feet away from the Chanel boutique which gives the perfect excuse for me to check out and drool over the latest Chanel RTW collection after I've satiated my hunger. Aubaine is a classic French cafe which doubles as a boulangerie and patisserie. It's also a place where beautifully dressed patrons gather and gossip. If you're a handbag gal like me, there are plenty of Birkins, Kellys, Chanels and the like to admire. However, most importantly, their Egg Florentine is the best I've ever tasted. The hollandaise sauce is sublime. Creamy without being gaggingly rich and the eggs are perfectly poached without the nasty aftertaste of vinegar. I'm a creature of habit and I tend to order the same thing each time I go. I adore their freshly baked bread and their dessert selection is to die for. Their staff are polite and attentive without being instrusive.